Darren Fletcher has revealed the lengths he has gone to in order to beat a debilitating illness which has kept him sidelined for much of this season. Suffering from Ulcerative Colitis, the Scotsman has been searching desperately for a treatment to help him manage his condition and resume his role in the champions' midfield. 'It’s something that will never leave me, but you have to find somehow a way to manage it so that I can still play my football. 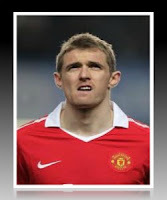 “I’m trying everything under the sun at the moment, diet, hypnotherapy' Fletcher told reporters at a United Foundations charity event last night. The Scotsman then went on the say that he hoped to return to football next season.